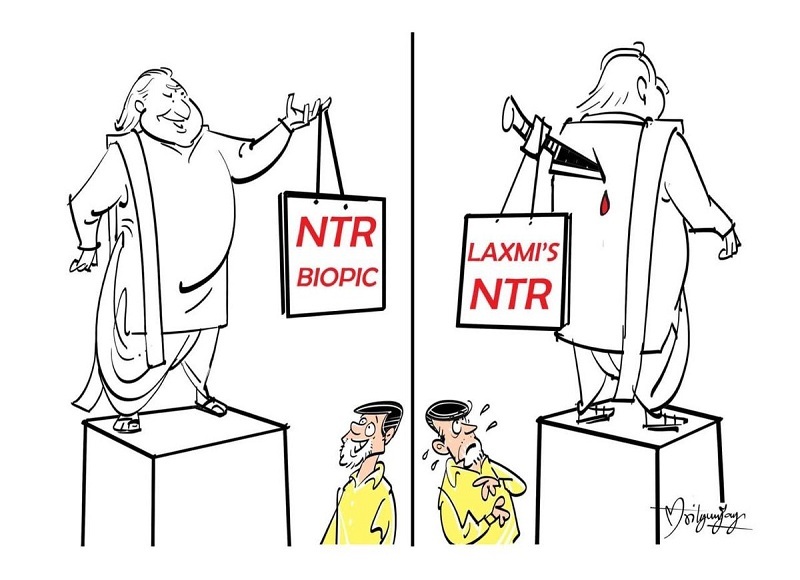 Trailer of NTR biopic is winning hearts of Telugu film lovers. NTR Kathanayakudu is set for release on January 9th and NTR Mahanayakudu will be hitting screens on February 7th. Balakrishna rocked as his father legendary NTR. Trailer gives a glimpse of intense political scenes. Everyone wonder if Krish includes the controversial episode of Chandrababu Naidu taking over power from his father-in-law. Rana Daggubati is playing Naidu in the movie. Meanwhile, Ram Gopal Varma who is making Lakshmi’s NTR focusing only on the dark episode of NTR’s final days is pulling the legs of Kathanayakudu makers by releasing songs from his film. Vennupotu song is creating stir in political circles for showcasing Naidu as villain. TDP folks have complained against RGV for it. The thug of a director continues his provoking tweets sharing crazy memes criticizing NTR biopic and Naidu. Here’s one cartoon shared by RGV that is going viral on social media. Tweeple are in splits with these posts. TDP sympathizers are slamming RGV for it. On the other hand, Lakshmi Parvathi and YSRCP people are supporting RGV.